So, let’s see here. What are data aggregators and what do they do? Basically, they collect data and compile information from different databases and individuals in order to sell that information to others. In regards to local citations, there are several major data aggregators that collect local citation information about local businesses such as the business name, address, phone number, website, description, hours of operation and so on. They then validate this information using their various validation methods such as USPS address validation to make sure the addresses are correct and Telco to verify that the phone numbers are accurate. Once this information has been “cleaned up”, they make it available to publishers like Google, Yahoo, Bing, Yelp and YellowPages just to name a few. 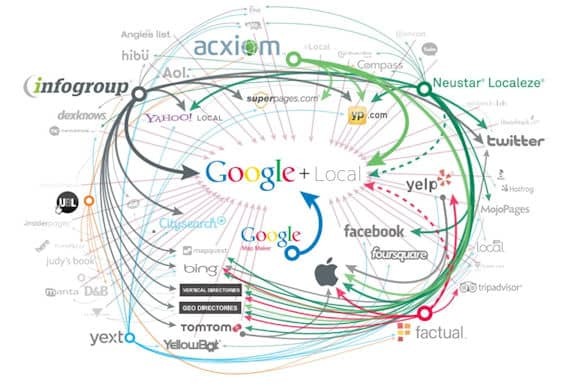 When Google, for example, goes to update their Google My Business listings (formerly Google Places), they will pull data from these local data aggregators. They take data from several sources and compare it to what they currently have in their database and update it with what information they deem accurate. This is why having your local business data consistently listed with each data aggregator is pertinent. Publishers like Google pay big money to have access to this kind of local business data, especially if it’s coming from a highly trusted source and they know that the local business data has been through several verification processes. There are several large data aggregators who are at the top of the food chain and if you’re a local business, you can’t afford to not be included in their data files. What Can Pigzilla Do For Me? I’m a local SEO consultant and I can help. If you want to submit your local business data to all the major data aggregators on your own, we won’t stop you. This will require you to contact each local data aggregator on your own, establish a relationship with each one and then submit your local business information to them in several different formats since they all want different arrangements of your data. In addition, you will have to pay full price, unless of course you qualify for a large volume discount. Most likely this doesn’t sound very appealing to you, unless you are a local search nerd like me. So, where do I come in? I have you take 15 minutes to fill out one data sheet full of your local business information the way you want it to show on the Internet. Then I submit your local business data to the major data aggregators for you! If any of your local business information changes, no problem! Just update your data sheet and resubmit it to us. I will make sure it gets updated with each local data aggregator. Note: A Google My Business (Google Places) listing or Facebook Places Page is required. One of these will be used to verify your business address. If you do not have one yet, I will set one up for you.